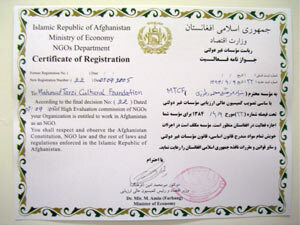 MTCF IS APPROVED BY HEAD OF NGO DEPARTMENT AND CONFIRMED BY HEC. MTCF essential offices are making their organizations. Renovation started in head office of MTCF in Mahmud Tarzi High School. Members of Board of Founders sent an appreciation letter to dr. A. Farhang, the Minister of Economics. 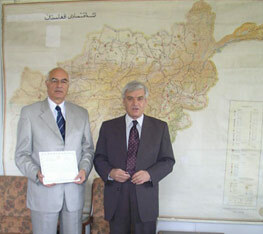 Mr. O. Tarzi, Chairman of MTCF going to Kabul to receive their certificate from H.E. 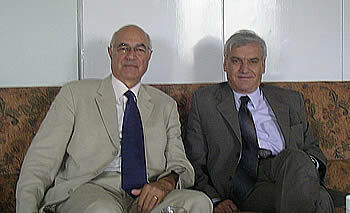 dr. Farhang. MAHMUD TARZI CULTURAL FOUNDATION IS ESTABLISHED ON THE 1ST of SEPTEMBER, 2005 – SANBOLA 10,1384 – IN KABUL-AFGHANISTAN. H.E. A. FARHANG(dr),THE MINISTER OF ECONOMICS PERSONALLY HANDED OVER THE CERTIFICATE OF FOUNDATION TO MR. A. OMER TARZI, CHAIRMAN of MTCF ON 25TH SEPTEMBER IN HIS OFFICE TOGETHER WITH MR. SAYEED HASHIM BASSIRAT,HEAD OF NGO’s DEPARTMENT. MR. TARZI THANKED H.E. FOR HIS VERY SENSITIVE ASSISTANCE DURING THE ESTABLISHMENT AND ADDED; “WE AS THE FAMILY, REALIZE THE IMPORTANCE OF BEEING MAHMUD TARZI DESCENDANTS. WE TRY TO PAY OUR UTMOST ATTENTION FOR EVERY STEP WE TAKE FOR THE GOOD OF OUR COUNTRY. OUR MAIN POWER IS BASSED ON THE POSITIVE SUPPORT OF AFGHAN PEOPLE. I PROMISE TO BRING EVERY PIECE OF EFFICIENCY WE HAVE, TO AFGHANISTAN AND TO AFGHAN YOUTH. WE ESTABLISHED THIS FOUNDATION IN AFGHANISTAN BECAUSE WE TRUST AFGHAN PEOPLE TO FIND BETTER RESULTS FOR THEMSELVES WITH THEIR OWN EFFORTS AND WE WANT TO BE A PART OF IT. MR. BASSIRAT, HEAD OF NGO DEPARTMENT SAID THAT HE IS VERY HAPPY TO SIGN THIS CERTIFICATE OF MTCF AND THANKED TO TARZI FAMILY TO MAKE SARDAR MAHMUD TARZI’s NAME IMMORTAL. H.E. 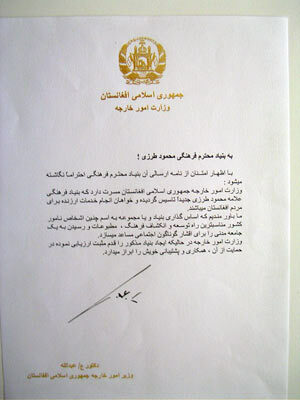 ABDULLAH ABDULLAH, FOREIGN AFFAIRS MINISTER SENT A CONGRATULATION MESSAGE TO HQ OF MTCF. H.E. 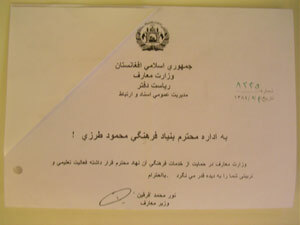 NOOR M.QARGEEN, MINISTER OF EDUCATION ALSO SENT A CONGRATULATION MESSAGE TO MTCF HQ.